This is a super interesting deep look into one of the most underrated nutrients in our body. This post could have never been completed without the help of one of my dear friends Billy Mitchell. Billy first made me aware of the importance of iron status last year, and I've been using his insights to help me investigate complicated disease processes. Follow Billy's insights into health on his website The Robust Human. Are you tired of being tired? You ask yourself “Why have I been dragging my feet on a daily basis?” It certainly doesn’t help that it’s Monday, right? You smack your alarm clock and roll out of bed, unready to take on the day. “Why is it so chilly?” You check your thermostat, set to a comfortable 76 degrees. Hmm… that’s strange. Downstairs you go to get your coffee ready and have a little something for breakfast. You feel like your legs are super heavy and you lose a tiny bit of breath as you walk back upstairs to shower. You noticed more of your hair getting caught in the drain than usual. You remember, you were going to pick up some of that biotin stuff you saw posted on Facebook. Off you go. The drive is no better. In and out of thought. You worry about the things you need to complete this week. You feel your heart skip a beat as the small bit of background anxiety you experience seems to elevate. “Ugh… not this again.” All the while you are irritated by all the dumb things happening on the road. Things that never irritated you before. Things aren’t much better at the office. This project you’ve been working has been a struggle because of this constant brain fog you’ve been dealing with. The caffeine from your morning cup of java wears off and you’re tanked. Time to get up for another! “Why is it so chilly in here? Can someone turn up the thermostat!” You get through another grueling 5 hours and head out. You force yourself into the gym and jump on the treadmill. Only 10-minutes pass by before you you’re huffing and puffing. Everything burns. What gives? You aren’t even pushing yourself that hard. Another lousy workout in the books. The quality time planned with the kids before dinner doesn’t happen. The energy just isn’t there. Instead, being on the couch watching TV seems more reasonable. Four hours go by, which seemed like 30 minutes, and you realize it’s time for bed. Getting to bed isn’t easy. You constantly toss and turn and have this incessant need to move your legs around. Eventually you fall asleep. The alarm goes and it’s back to the grind. A few more months of this go on and you’ve decide you’ve had enough. You’ve been to your primary care provider in the past for this issue, but he’s always said that you’re as healthy as a horse! You decide to visit a Naturopathic Medical Doctor, you’ve heard good things about him from a friend at work and you set up an appointment. The first visit, you’re super skeptical, but you’re intrigued by some of the things he’s saying and impressed by how much detail he is collecting about your story. You are explained the purpose of all the lab tests run and how they help us assess iron status in more detail. You agree. The tests come back and your ferritin is above the lower end of the reference range. But two other markers suggest the ferritin is falsely suggesting you are sufficient in iron. You’re written a script for IV iron infusion. Which, you’re not excited about at all, because you hate needles. But you soon realize that annoying hour was worth it. Within a week your energy is up, you’re killing it at work and in the gym. You aren’t wondering about the thermostat frequently. The anxiety is gone. No more leg cramps. Hair isn’t clogging your shower drain anymore. You’re waking up feeling energized! You haven’t felt this good in years. Anemia simply means that your body does not have sufficient oxygen carrying capacity to the cells in your body. There are many forms of anemia. Normocytic-normochromic (normal red blood cell, with normal color) anemia happens after blood loss. This makes sense, low blood volume equals less oxygen. This could happen after an accident or even with internal blood loss for example ulcers. Pernicious anemia happens when levels of vitamin B12 are low. Another form of anemia happen because of genetic defects. For example, Sickle Cell anemia occurs when the body makes sickle cells (instead of nice round cells) because of a genetic defect. Hypochromic mycrocytic anemia (low color and small size) anemia happens when we don't the required components to make red blood cells. The body compensates by creating red blood cells that are sub optimal. This happens when we have lead toxicity, infections or iron deficiency. This post mainly covers this type of anemia. All anemias are responsible for low oxygen delivery to tissues. No not bacon. I’m talking about the element in that fortified cereal you are hopefully not eating every morning. The ugly brown stuff apparent on the rust of your favorite classic car. The critical element necessary for life. Iron is a metal our body incorporates into a structure called Heme. Our bodies make heme from the proteins we consume every day. You can sort of think of proteins like a bunch of Legos organized in specific way. We chew and digest those proteins into individual Legos, which our body absorbs and then reconfigures into structures like heme. Heme needs iron to function properly. The miracle of converting your food into energy occurs in little organelles we have called mitochondria. Remember heme? Heme is also incorporated into proteins in our mitochondria that help us strip the electricity off of food in a process that requires oxygen. Need to paint the house? Got a big workout coming up? Is it time to study for midterms? Maybe it’s bed time? Yes. Bedtime. Just about everything we do requires energy, and having good iron status is essential to the processes that happens within the cells that ultimately translates into activities. We’re exposed to insults on a daily basis. The first insult we are going to discuss are pathogens. Is Dave sneezing at the office? If it’s not Dave it’s someone else. Need to print something out on the copy machine? Where have everyone else’s hands been? Modern living subjects us to more human specific pathogens than ever before. And that requires a primed immune system. Your immune system has many different parts. Think of it as the “armed forces”. You’ve got your special forces, your air force, your navy and the marines. The marines are just as important as all the other components. Iron is critical to the function of the marines in neutralizing any targets. Your immune cells actually harness the power of free radicals. You may have heard of free radicals in other reading you have done on antioxidants. This is important to understand, because there is generally a negative connotation between free radicals and health. But the reality is you need them just as much as you need antioxidants. Iron essentially equips your marines with the weapons they need to neutralize pathogens. Remember heme? It’s back again. Your marines harness a heme-dependent protein called myeloperoxidase. This protein helps the marines make bleach, which is really cool. It’s sort of analogous to how we kill germs with chemicals in our everyday environments. So you’re cold, constipated, cranky and gaining weight. Or suffer from dry skin and thinning hair. Well maybe it’s not thyroid medication you need. In fact, what your thyroid might need instead is iron! Your thyroid takes up iodine and uses an amino acid called tyrosine to make thyroid hormone. Do you remember the protein we discussed at the beginning? Our friend heme is responsible for the production of thyroid hormone. A protein in your thyroid called thyroperoxidase makes the combination of iodine and tyrosine possible. Thus, your thyroid needs iron in order to make thyroid hormone. We have a series of enzymes referred to as the cytochrome p450 superfamily. This is the fancy way of referring to detoxification. Try that piece of trivia at the dinner table and see what kind of looks you get. Guess what these enzymes need? You nailed it! Heme. P450 enzymes use heme, oxygen and several other cofactors to transform any toxicants coming into the body. We need to transform chemicals coming in so that we can put them into our urine and feces. And while other means of cleansing are important we have to remember the basics. Juicing, intense exercise, fasting and the like are nowhere near as effective and even potentially harmful if the iron dependent machinery we discussed above is not functioning properly. Imagine trying to take out your trash without even having some means of accumulating it in an organized way. Instead you just decided to discard things wherever was most convenient for you in your living environment. Trash in the bedroom, in the bathroom, in your closets. And that is exactly what is happening in the body. We take toxicants we have stashed in an organized way and muck up the workings everywhere else. The cytochrome p450 superfamily we discussed has another important role. Ever heard of cholesterol? Of course, you have. The root of all evil. Destroyer of arteries. New dent in your car? Yeah it was cholesterol. Actually, cholesterol doesn’t do any of that. Although, I recall this incident where a friend actually dented another friend’s passenger door with an egg. Cholesterol is needed for the synthesis of hormones, using the p450 enzymes (yes, the same superfamily in charge of detoxification). Your cells talk to one another in many ways. One of the ways this is done is with hormones. You can sort of think of hormones as a signaling mechanism. Let’s delve into estrogen signaling. Ladies need estrogen for that wonderful looking skin, keeping unwanted hair at bay, fat in all the right places, among other things. All the vanity stuff, right? And then other health components you may deem less important like bone health, your ability to be fertile, and even making sure you don’t have too much signaling from other tissues like your thyroid. Ovaries and adrenals need to send the estrogen signal in the right proportion to other hormonal signals. Iron is needed to make sure you are making enough of the hormonal signals and at the same time we don’t want to get more of the message than we need. What happens when we get more of what we need? Your metabolism is harmed, your cycles become erratic and you increase your risk for cancer. Iron is also important to detoxify our hormones. The p450 proteins also include enzymes that help us get the extra signals muted (detoxified). All of these machinery depends on iron. Not enough iron can impair your fertility, make you bloated, crampy, irritable and ravenous during certain times of the month and also increase your risk of cancer. Iron is one of the most common nutrient deficiencies, with an estimated 2 billion people having inadequate levels. The signs and symptoms of anemia are not very specific unless deficiency is very severe. This means that there are other disease processes that mimic the signs and symptoms of iron deficiency. Some of the common symptoms of iron deficiency include fatigue, shortness of breath, leg cramps, headaches, dizziness, and cold intolerance. In more severe deficiency, nail abnormalities, anxiety, depression, and heart palpitations might be present. Because iron is so central to just about every process in the body, deficiency likely occurs in a continuum. If the symptoms are there, you want work with your doctor and do some further investigation. The blood work that needs to be done is a Complete Blood Count (commonly referred to as a “CBC”) and Iron Panel. You might also consider C-Reactive Protein (CRP) and Erythrocyte Sedimentation Rate (ESR), which I’ll discuss for you in a second. Care should be taken in interpreting lab work, especially in cases where the patients have complex presentations. Anemia of chronic disease is a disease process that can make your lab work suggest that iron deficiency is present when it is not. The cause is chronic inflammation. Your body has mechanisms in place to tuck iron away into safe compartments and keep it away from the enemy. Just like iron is super important for your health, iron is also important for the replication of pathogens and even cancer. You can sort of think of iron as contraband for the bad guys. Thankfully we have evolved mechanisms to “hide iron” from the bad guys in order to prolong survival. The process of inflammation will prevent the normal utilization of iron and eventually the manifestation of anemia. When the body senses abnormal levels of inflammation, it sequesters free iron, and stores it, to prevent pathogens and even cancer from utilizing it. We can help tease out this detail by looking at a marker of inflammation called C-reactive protein. C-reactive protein is part of the cleanup process involved in minimizing friendly fire after your immune system has engaged in combat. It protects against autoimmunity. Typically, it is elevated in a chronic inflammatory state. The extent of the anemia will depend on how long the disease process has persisted. But we would expect low hemoglobin. Remember, this does not necessarily mean you are low in iron. This is important to recognize so that one is not inappropriately subjected to iron replacement. In the face of anemia of chronic disease without iron deficiency, ferritin concentrations will be will likely be greater than 100ng/dL. If anemia of chronic disease is present with iron deficiency, we would expect ferritin concentrations to be much lower, in the range of 30-100ng/dL. It’s important to recognize that there is controversy in supplementing iron in anemia of chronic disease or during chronic infection. We’ll discuss this further in the supplement section. Populations with iron deficiency fall in either of two categories. You may have a chronic issue that disturbs absorption or causes blood loss. The second category is dietary iron deficiency. If you have a chronic condition it’s important to work with your healthcare provider in finding out why you are deficient. Many folks fall into the second category as a result of changes in dietary pattern. The biggest culprit being diets the restrict meat . While it is true that there are many iron dense foods that are not meat, the reality is they are not reliable sources of iron for many individuals. In coming up to speed here on all the roles iron plays in the body, you can see there is a lot of opportunity to “patch the system” by adding supplements, botanicals and even hormones. You might feel better in the short term, but the fundamental cause of disease might not be addressed. Our goal should always be to remove obstacles to health, rather than palliating your symptoms with potentially harmful and expensive interventions. Another reason for having seemingly low iron levels is "Anemia of Chronic Disease". Most microbes have regions of their DNA referred to as “islands of pathogenicity,” which contain all of the instructions needed for the production of tools needed for acquiring iron. Virtually all bacteria, viruses and protozoa require iron for their replication and growth. One of the best studied critters related to the adverse effects of iron supplementation is Plasmodium. Plasmodium is a protozoon contracted from mosquito bites. Plasmodium is responsible for malaria. Malaria is mostly a problem in regions near the equator, primarily Africa, where access to quality medical care is poor. Studies in famished environments show that introducing iron rich diets increases susceptibility to malaria. Higher susceptibility is also seen in folks with higher hemoglobin and ferritin. These observational findings have supported clinical findings. Reviews of several randomized controlled trials show that iron supplementation is likely harmful . The World Health Organization guidelines for treatment of severely malnourished children in the regions suggest avoiding iron supplementation until wide spectrum antibiotics have been used to clear infections. Now, malaria may not be as relevant for you. But other chronic infections are, and even non-infectious diseases such as cancer. And similar to Plasmodium, taking iron in the face of these disease processes can make it more difficult for your immune system to clean house. If your chronic condition is not related to blood loss, dietary lack, or malabsorption, it would be a good idea to work with a practitioner that can assess whether or not iron repletion is appropriate for your case. 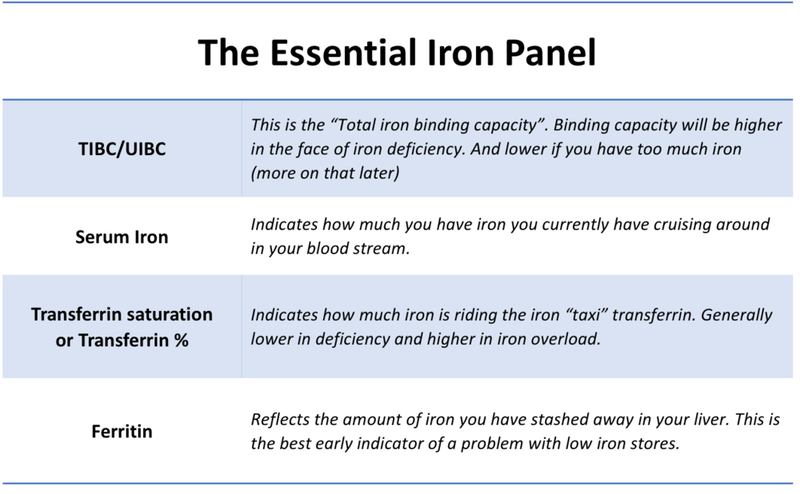 On the opposite end of the spectrum there is the possibility of having too much iron. Remember our discussion on antioxidants and free radicals? Iron has the ability to tip the scales toward your body having more free radicals than it needs. We want some, but not too much. Think of the way we use fire. When we go camping, we want a nice controlled small fire. We don’t want to burn down our campsite and the rest of the park we’re camping in.